Scene formed in 2014 as a practice and platform from which to promote the importance of art, design and architecture to the wider audience. Through thought-provoking and inspiring exhibitions, events and workshops, we encourage involvement and discussion in all aspects of current design. Our interests lie in the cross-over between art, architecture and design, which we believe have values that can enhance our day-to-day experiences. We wish to present design as something that can be inhabited, used and celebrated. 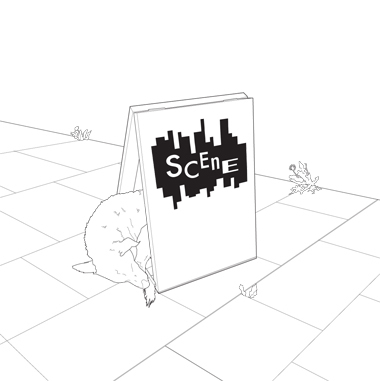 Scene is a design practice specialising in exhibition/ interior/ installation design and curation. Scene works between art, design and architecture to celebrate narrative within spatial experience: telling a story through materiality, process, place and time. Our aim is to create environments which convey ideas; stimulate the imagination; and encourage interaction. Both directors have over 8 years experience within architecture, and have transferred their skills in design and project management to work with clients from initial concept brief through to production design, build, and curation. We work in collaboration with practitioners from a wide range of disciplines, from artists; engineers; musicians and other designers, to meet the project’s needs as required, and love the richness this gives our work.